PLEASE NOTE A SLIGHT INCREASE IN PRICE AS OF 9/5/18. ENJOY OUR NEW AND IMPROVED 15 PAGE REPORT WITH MORE INTERACTIVE FEATURES. 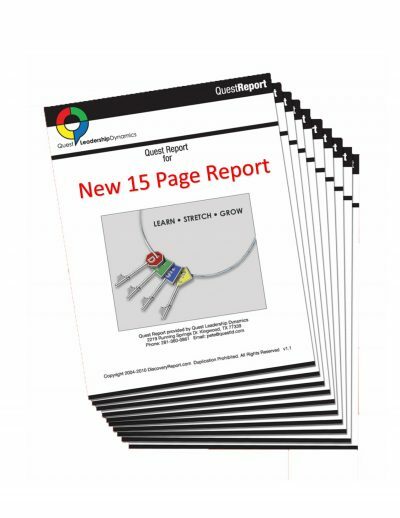 Quest Report 15 Pages Move ahead in minutes! Do you wonder what your strengths are? What really motivates you? Why do you get along with some people and experience conflict with others? 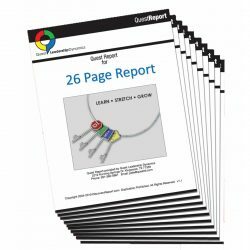 The Quest Report for adults is a personality test and report designed to reveal your individual keys to personal and professional success. Your customized personality profile will show you how to be more productive and how to greatly improve your relationships. You will learn a proven system that is easy to understand and simple to apply to your everyday life. Why take months or even years to improve when you can move ahead today!